Inverness reached the quarter-finals of the Homecoming Scottish Cup after a controversial win over Kilmarnock. Pavels Mihadjuks headed Inverness in front in the 34th minute from Ian Black's cross. Killie thought they had a penalty when David Fernandez was fouled but referee Iain Brines reversed his decision and awarded a free-kick outside the box. Kevin Kyle was sent off for the visitors before Adam Rooney's late strike sealed victory for Inverness. The home side created an opening in the first minute when Eric Odhiambo, who was making his first start for the Highlanders, combined with Richie Foran to set up Dougie Imrie, whose shot was high and wide. Kilmarnock goalkeeper Alan Combe raced off his line to avert the danger after Odhiambo raced on to Lionel Djebi-Zadi's through ball. At the other end, Kyle's header was claimed comfortably by Inverness keeper Ryan Esson. The injured James Fowler was replaced by Jamie Hamill for Killie before Imrie was again off-target after being set up by David Proctor. 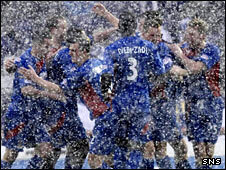 Downpours of snow prompted referee Brines to call for the introduction of a yellow ball. And within minutes, Inverness had taken the lead. Mihadjuks out-jumped the Kilmarnock defence to bullet the ball past Combe and record his second goal for the Highland club. As half-time approached, Mihadjuks was penalised for a challenge on Fernandez and the referee appeared to award Kilmarnock a spot-kick. But, as the Inverness players protested, Brines changed his mind and Kilmarnock had to settle for a free-kick outside the penalty area. Mihadjuks continued to pose problems for the Killie defence and headed wide from Foran's corner early in the second half. Rooney, who replaced Odhiambo, was put in on goal by Black but Frazer Wright averted the danger and won a free-kick for the visitors in the process. Kyle was dismissed with 20 minutes remaining following a clash with Proctor. Despite the reduction in numbers, Kilmarnock pressed for a leveller and Gavin Skelton forced a save from Esson. Combe then saved Imrie's attempted chip before Kilmarnock substitute Iain Flannigan's header from Skelton's corner was cleared off the line by Proctor. Foran could not take advantage of a mistake by Hamill, blasting over from inside the six-yard box. But Inverness did get the clincher when Rooney slammed the ball home from Ross Tokely's centre. "The boys have done really well. We said before the game it was chance to get through to the quarter-finals. "It's nice to get away from looking up the table all the time. "It was difficult conditions out there and Kilmarnock threw everything at us and even when Kevin Kyle got sent off it didn't really help us because they pushed a lot of men forward and put us under pressure. "We've not been in many winning positions this season so it was nice to hold on. The team showed resilience and we're delighted to go through." "The referee pointed to the spot and I thought right away that it was a stonewall penalty. The only thing I can think of is that he got in touch with the linesman and he said it was outside the box. "I asked the linesman and he said he couldn't see the line! You can't play a game if you can't see the line. They should have stopped the game and had the lines brushed. "But the referee was closer anyway and he gave a penalty. He must have had some doubt because as soon as the Inverness players complained that there was no line...they're obviously going to say it was outside the box. Inverness CT: Esson, Tokely, Mihadjuks, Djebi-Zadi, Proctor, Duncan (Kerr 76), Black, Munro, Foran, Odhiambo (Rooney 61), Imrie (McBain 86). Subs Not Used: Fraser, Byrne. Goals: Mihadjuks 36, Rooney 90. Kilmarnock: Combe, Fowler (Hamill 24), Hay, Bryson, Wright, Ford, Gibson (Flannigan 79), Pascali, Skelton, Fernandez (Russell 46), Kyle. Subs Not Used: Rascle, Nolan. BBC Sport Player Rater man of the match: Inverness' Pavels Mihadjuks 9.00 (on 90 minutes).